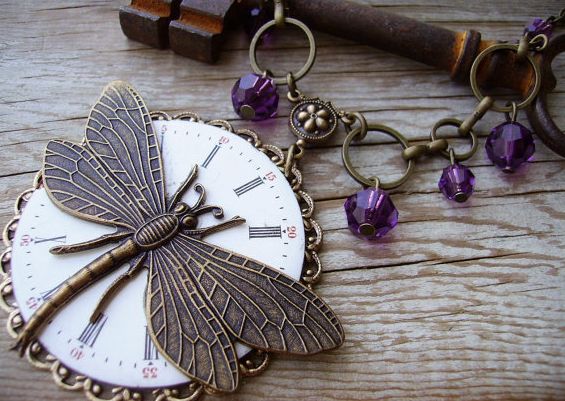 Victorian inspired steampunk insect jewelry has risen in popularity, but few know the history of these designs are echos of elegant designs made more than a century ago. Throughout the Victorian era, images of the natural world were popular in jewelry, fashion, and furniture design. One of my most popular Time Flies necklace designs harkens back to earlier designs. I made this large statement pendant with an ivory colored antique pocket watch face, probably art deco, with red and black numbering. The detailed antiqued gold and brass butterfly stamping is reminiscent of art nouveau designs by the French designer Vever. Vever was a family-owned jewelry design house that opened in 1821 in Metz, France. They specialized in precious gem setting as well as semi-precious and organic gemstones, creating high quality art nouveau designs popular with upscale clientele. The family company won a Grand Prize for gem-set jewelery at the 1899 Paris International Exposition, and contributed to exhibitions in Moscow (1891), Chicago (1893), and Brussels (1897). The firm won a second Grand Prize at Paris’s 1900 International Exposition for their exquisite gem-set Art Nouveau jewelry designs. This 1894 Late Victorian evening gown is from the archive of the Victoria and Albert museum - you can get lost for hours! Made in a gorgeous black accented with glass beads and sequins, trimmed with tulle, embroidered net in a design of butterflies applied to the skirt and bodice, lined with silk, the bodice strengthened on the inside with whalebone. The large sleeves are also typical of this period, a revival of similar 1830s balloon style sleeve, called l'imbecile (silly) or a la folle (foolish). These exaggerated sleeve styles often required small down shoulder pillows, called sleeve pumpers. From the 1840s until the brief revival in the 1890s, sleeves were more tailored. Pictured at right, this Compass Rose Design custom dragonfly design was a custom request - I love how it turned out with the amethyst Swarovksi crystal drop bead detail. Again, this brass dragonfly has incredible detailing and fabulous whimsy. Victorians put great stock in symbolic romantic ideas, drawing upon ancient symbols in sentimental designs. 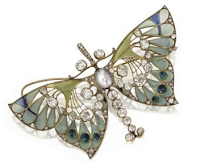 These jewelry designs reflect the late nineteenth-century interest in the natural world, including moths, butterflies, dragonflies, and others. 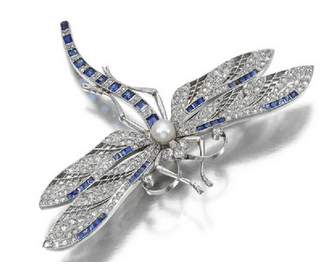 The diamond, sapphire and pearl dragonfly brooch is art nouveau - circa 1890-1905. Our Queen Bee design captures this Victorian trend and the celebration of all things insect. You can see more of my Compass Rose Design Jewelry Steampunk and Victorian Insect Jewelry in our shop.